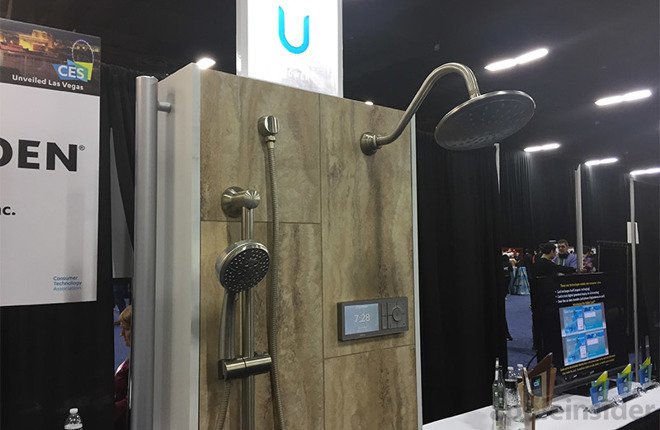 U by Moen saw release last year as a digitally controlled smart shower and valve system that lets users preheat shower water, adjust temperature settings for up to four outlets, set timers and remotely start or stop water flow via a touchpad or connected app. Announced at CES on Sunday, the latest iteration of the U system integrates voice control through Apple's Siri and Amazon's Alexa virtual assistants. Alexa compatibility arrives in the first quarter as a third-party extension, while Siri and HomeKit will see integration in quarter two. Moen showed off U in a demonstration, explaining that users simply ask the assistant of their choosing (Alexa on the show floor) to turn on the shower head or set a desired temperature. Water begins to flow from the outlet until a desired temperature is reached, then the system pauses, waiting for a user to enter. Other commands include macro presets that can be customized in the U by Moen app. For example, a multi-fixture spa setup might include different temperatures for separate water outlets like a shower head, hand wand or side sprays. Pricing varies, but a basic controller and valve system comes in at $1,160 with included shower head and wand, while a four outlet spa style arrangement goes for $2,200.